My younger sister spent a few days in Bohol with her high school best friends during the first week of June. She went home with a lot of pasalubong (bring-home goodies), like danggit (dried rabbitfish) and Bohol’s peanut delicacies, namely Peanut Kisses and Peanut Fingers. According to the package, Peanut Kisses is the No. 1 Boholano delicacy. It is made with all natural ingredients, and it has no preservatives. Peanut Kisses are peanut and egg white cookies, shaped like the famous Chocolate Hills of Bohol. They are crunchy, but I find them a bit hard to bite. I actually like the Peanut Fingers more. They have just the right amount of sweetness, they’re easier to bite and yes, they really taste like peanuts! Peanut Kisses and Peanut Fingers are both made from peanuts, egg whites and vanilla. The main difference in their ingredients is that sugar cane is used in Peanut Kisses, while sugar is used in Peanut Fingers. Have you tasted both Peanut Kisses and Peanut Fingers? Which peanut delicacy do you like better and why? 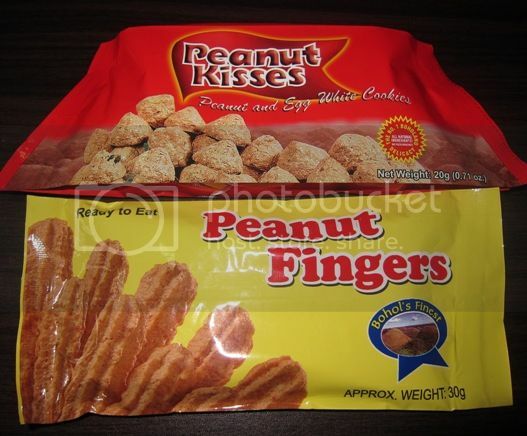 This entry was posted in Bohol, Peanut Fingers, Peanut Kisses, Snacks. Bookmark the permalink. yummm. i love anything with peanuts! egg white cookies? how does it taste??? waah! nacurious ako! parang ang naiisip ko is yung merengue haha.. i love merengue! what more kapag may peanut hahaha. I shouldn’t miss this delicacy when we visit Bohol. Peanut Kisses rules!!! ^_^ nothing beats the original….